Polycarbonate Bottle for use in Ultracentrifuge Rotor Type 45 Ti (part # 339160); Required Cap Assembly: 355623 For use in High Performance and High Capacity Rotors: JS-5.2 (part # 339087); Required Adapter: 339104 JS-4.2 (part # 339080); Required Adapter: 339104 JS-4.2A (part # 366695); Required Adapter: 339104 JS-4.0 (part # 339086); Required Adapter: 339104 JS-3.0 (part # 339081); Required Adapter: 339104 Note: Bottle assembly. 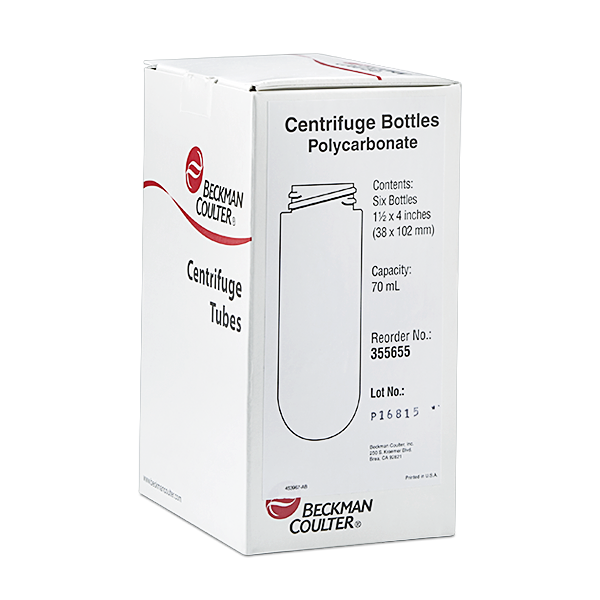 Reduce speed to 35,000 RPM when the bottle is centrifuged less than full (minimum fill volume is 35 mL). This product replaces part # 265655.